How wonderful it was to get a little convo from fellow Etsy seller, zJayne, yesterday. 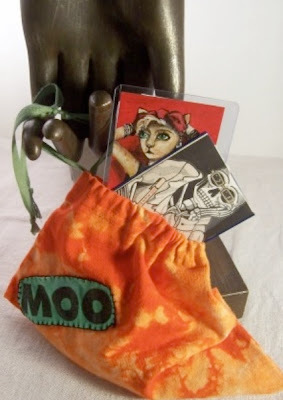 Jayne is selling this adorable little wristlet made of recycled t-shirts sleeves, and embellished with a t-shirt cutout. In one of her photos she shows the wristlet holding a couple of ACEOs. So Jayne had convoed me to ask permission to show my ACEO. Jayne bought "Mew-Donna" from me last year on eBay. Also shown is a fantastic piece of art from the amazing inkdot on Etsy. How cute to see the little bag being used to carry ACEOs, and mine being one of them! As for eBay... Both of these artists I recognize from eBay. Did you know there is a ban happening right now on eBay? They've raised their prices again, and more importantly they are making it impossible to leave a negative feedback for a buyer. Well that seems very unfair, and while most people I've dealt with on eBay have been super lovely, I know there is the occasional rip off. I'd hate not to be able to leave a negative, if this was deserved. So I'm not buying or selling until the ban is over, which is Feb 27. My favorite contest, Nibble Fest has even postponed their event until after the ban. So if you like to participate in that, look for the entries from February 27 thru March 5. Luckily we have Etsy to find some fun things to buy! ugh i wish id known about the ban on ebay before i bought 3 things off of there. oh and i totally forgot! love the bag and your "Mew-Donna"! I'm kind of glad for the ebay strike. I don't sell there anymore, haven't for years, but i do buy there often. Now i have more reason not to spend frivolously online! Thanks for your comment on my blog on my Beatles purse. I love your blog - awesome! Yes I'm a member of ebay since 2004. Sellers are not happy with their changes. FVF's are up 60%! Please let me know if you'd like me to link your blog and wonder if you'd like mine? I LOVE ETSTY! Thanks for the blog notice ...but it's your art that has made me smile for so long. I have 'Mew-Donna' on the neatest magnet card holder right on my desk, so I see it every day. I think you captured such a whimsical punny piece and I'm proud to own it!